"Her Majesty that Saturday night was lodgid again in the Castell of Warwick, where she rested all Sonday, where it pleased her to have the country people, resorting to see her, daunce in the court of the Castell, her Majestie beholding them out of the chamber window, which thing, as it pleased well the country people, so it seemed her Majesty was much delighted, and made very myrry." [from Nichol's Progresses, ed. 1823, I, 319]. As dancing was held in high esteem at court, it seems likely that dancing masters would attempt to create new dances that would garner approval from the court. Interest in the new form of country dancing spread from the royal court to other artistocratic and cultured venues. In 1651, the noted London publisher John Playford produced the first printed collection of country dances for sale, titled "The English Dancing Master," which contained the music and instructions for 105 dances. It sold well, and a second edition was produced the following year. In all, Playford and later his son Henry Playford and others, produced 18 editions until 1728, adding or deleting dances as fads and fashions changed. Country dancing gained popularity throughout England, as well as Scotland, Ireland, Europe, and the American colonies. Public "assemblies" introduced in the 18th century, held in publicly accessible ballrooms made country dancing available to the new, rising middle classes as well as the aristocracy. Publishers and choreographers competed with annual collections of new dances to feed the growing appetite, and dancing masters built careers teaching style and repertoire. 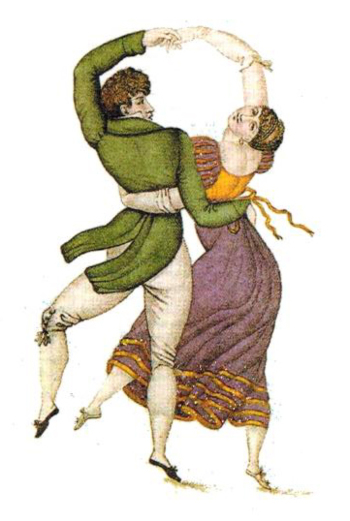 Interest in the English country dance peaked in the late 18th century (as described, for example, in Jane Austen's novels and letters), and then quickly faded as social dancing in society was revolutionized by the introduction of the waltz, polka, and other couple dances in the early 19th century. Dormant for 100 years, interest in the English country dance was re-awakened during a period of cultural nationalism that surfaced in England and other European countries in the late 19th and early 20th centuries. Cecil Sharp, an English musicologist and teacher, is credited as the primary re-discoverer of the country dance, both in its surviving vernacular form in the small villages of the English countryside, and in the 17th-century printed collections of Playford and others intended for the cultured classes. Sharp re-interpreted country dances for contemporary audiences, and tirelessly promoted the genre as suitable for schools and youth groups as well as adults who he felt should have their great traditional dancing "returned" to them. Interest in these dances continued to grow in the 20th century. In the last 30 years, hundreds of new dances and tunes in English country dance style have been composed by English, American, and European composers in a burst of creativity surpassing even that of the 18th century.